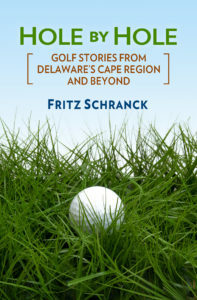 For most Cape Region golfers, fall is when their swing is about as consistent as it ever is during the entire golf season. The fall is also the best time to see about buying a new driver, or set of irons, or maybe that fill-in hybrid they’ve decided they need. Major club manufacturers are starting to announce their new club designs for the new season, in preparation for the big push next January at the PGA Merchandise show in Orlando, FL. This means the latest and greatest of the 2015 season will be discounted, as club pros and golf shops try to clear their inventory. If you’re thinking of buying a new driver or other golf club in order to take advantage of this happy confluence of events, you should make an appointment with a club pro for a session with a launch monitor. Launch monitors, such as those sold by Trackman and FlightScope, use radar to track the flight of a golf ball, and project the effect of your swing upon the ball’s trajectory. Other systems use camera-based technology to make similar projections. I tried out two new Cobra drivers with a launch monitor at last January’s PGA show, and was impressed by the information the system provided. My golf swing is different now, thanks to golf lessons and multiple practice sessions, so I made an appointment with The Rookery’s Kyle Deas to see what the launch monitor data suggested about my current drives. We met at the Rookery South range, and Deas set up the club’s FlightScope monitor, linked to his iPad tablet. After first warming up with a half-bucket of balls, I began hitting my 12-degree Ping G15 driver, with the monitor tracking the results. Once we settled on which drives were “typical”, Deas and I looked at the averaged results of several swings. The most noteworthy data showed that I hit up on the ball at impact, and by quite a bit, with a launch angle above 16 degrees. This means that my drives go high and with very little roll after the first bounce, because the ball flight is so steep on its way back to earth. We then experimented with an adjustable Ping G30 driver, set at 9 degrees. Lowering the driver loft had an immediate impact. The launch angle was closer to 13-14 degrees, which for my 85-90 mph swing speed is about ideal. The ball traveled a little farther in the air, but especially on the ground once it landed. 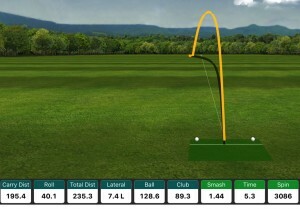 A Flightscope screen shot of a drive with a Ping G30 set to 8 degrees loft, swung at just over 89 mph. The ball rolled 40 yards after a 195 -yard carry. The picture accompanying this column shows a screen shot of a G30 drive, this time with the loft adjusted to 8 degrees. The airtime remained about the same, but the 40-yard roll was far longer than what I’ve been seeing with my current driver. The net effect of the adjustments was an average increase of 20 to 30 yards, depending on how close I hit the sweet spot on impact. “To me, no one should get a driver without going through this [launch monitor process],” Deas said. I have to agree. The loft designation on the driver is not the most important number to keep in mind when trying to maximize your distance off the tee. If you have a pretty consistent swing speed, what really counts is the combination of driver loft and the degree to which your clubface is heading up, level, or down at impact. Because I swing up at the ball at impact, my 12-degree driver simply has too much loft, making it perform more like a 3- or 4-wood instead of a driver. The fitting process also convinced me of the benefits of an adjustable driver, instead of a single fixed loft. The launch monitor enables golfers to tweak their drivers on the range to find the best mix of loft and other equipment options, including shafts. It’s not a good idea to adjust the driver for every round, however, and the Rules of Golf don’t permit adjusting during a round. Nonetheless, the fine-tuning that an adjustable driver can provide, with a critical assist from a launch monitor session, can help you obtain the driver that best fits how you actually swing. The University of Delaware Women’s golf team hosted their 3rd annual Fall Invitational Tournament at Rehoboth Beach Country Club Oct. 24-25, with thirteen teams from all over the East Coast. Harvard University won the 54-hole event, which featured 36 holes on Saturday and a concluding 18 holes on Sunday. Two Crimson golfers, Lito Guo and Anne Cheng, finished first and second respectively. Rehoboth Beach Country Club hosted the tournament once again, and its members provided 33 volunteers to help with spotting, live scoring, and other assistance. The teams and their order of finish were as follows: (1) Harvard University; (2) University of Delaware; (3) University of Pennsylvania; (4) Rollins College; (5) Georgetown University; (6) Lehigh University; (7) Seton Hall University; (8) Towson University; (9) University at Albany; (10) Monmouth University; (11) U.S. Naval Academy; (12) Central Connecticut State University; and (13) Delaware State University.